It is a commonly known fact that combining therapies in Aesthetics optimizes results. Such is the case as well, in Feminine Vaginal Rejuvenation. Different therapies have different targets and different mechanisms of action to reach a common goal. They can work synergistically to create better results than using only one mode of therapy. An Essence Laser & Wellness Exclusive is the combination of the external and vaginal rejuvenation Ultra Femme 360™ Radio frequency device and the PRP injection, the O-Shot ®. HOW DOES COMBINATION THERAPY IMPROVE RESULTS? In combination the two treatments work synergistically to achieve “the whole that is greater than the sum of its parts”. Essence Laser & Wellness is the only practice in Colorado offering the combination treatment of the O-Shot with the Ultra Femme 360 Radiofrequency device, to give the best possible results in Vaginal Rejuvenation! 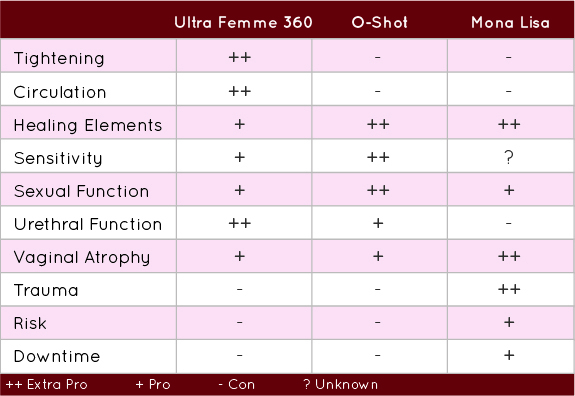 HOW DOES THE ULTRA FEMME 360 COMPARE TO THE MONA LISA TOUCH CO2 LASER? The Mona Lisa Touch CO2 laser is an excellent procedure for medical issues involving severe sexual dysfunction such as debilitating vaginal atrophy associated with aging, and/or chemotherapy, etc, and issues necessitating the supervision of an OB/GYN physician. The Mona Lisa Touch CO2 laser is a more aggressive therapy that requires creating trauma to the tissue to obtain the desired results. As such, there is more discomfort with treatment, and a higher risk of complications, such as infection, burns, and a longer healing time. The Mona Lisa Touch CO2 laser uses columns of heat to create a controlled injury to the tissue to stimulate the production of healing elements, growth factors, etc., which in turn serve to rejuvenate the vaginal tissue. Thus, the procedure requires trauma to the tissue to get results. Most women do not need that degree of therapy. Most women have mild to moderate sexual and/or urethral dysfunction and will achieve their desired results with a less traumatic and aggressive therapy such as the Ultra Femme 360™ Radio frequency and/or the O-Shot ® PRP treatment, in which there is no trauma to the tissue, and virtually no risk of infection or downtime. indications for the Mona Lisa Touch therapy. As mentioned, the mechanism of action of the Mona Lisa Touch CO2 laser is to create trauma to induce the production of the healing elements and growth factors by the tissue to achieve rejuvenation. The O-Shot ® PRP treatment draws these same healing elements and growth factors from the patient’s blood in a more concentrated form and delivers them to the localized areas that are the most important for sexual and urethral function without creating the trauma that the Mona Lisa Touch does. In summary, most women will be better served by the Radio Frequency Ultra Femme 360™ device and/or the O-Shot ® PRP treatment to better target more of the common issues with less pain, trauma, and downtime compared to the Mona Lisa Touch CO2 laser. Women with severe sexual and/or urethral dysfunction should be seen by an OB/GYN physician, and may benefit from the Mona Lisa Touch treatment and/or surgery. The combination of the O-Shot ® PRP treatment with the Ultra Femme 360™ radio frequency device targets more symptoms, and is the least invasive, of any feminine rejuvenation treatment available. Essence Laser & Wellness is the only practice in Colorado offering the combination treatment of the O-Shot ® PRP treatment with the Ultra Femme 360™ Radio frequency device, to give the best possible results in Feminine Vaginal Rejuvenation! Click here to schedule your complimentary consult today!